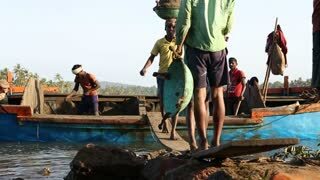 Boat standing on shore on wooden construction in Goa. GOA, INDIA - 21 JANUARY 2015: Men walking on wooden board that connects boat and beach. GOA, INDIA - 20 JANUARY 2015: Fishermen crossing wooden board that connects boat and shore. 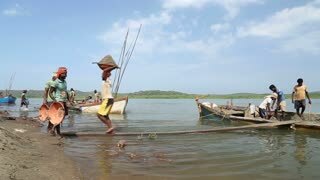 Fishermen crossing wooden board that connects boat and shore. 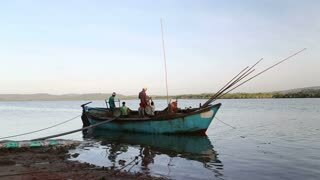 GOA, INDIA - 20 JANUARY 2015: Fishermen in boat on shore in Goa. 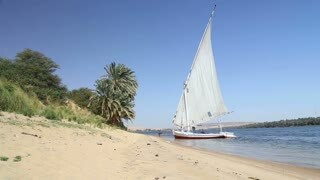 Felucca, traditional wooden sailing boat on shore of Nile. 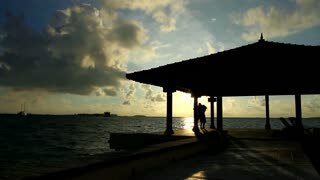 Wooden pier in the summer day. Sailboards standing near the shore. Morning in the nature. Old wooden mooring in the evening on sunset with motor boat near the coast. Speed ships standing near the pier.